The match will be even if looked from the team’s form perspective. Thus, it becomes interesting to watch it today. Moreover, it will more of a test for both the captains Rohit Sharma of MI and Suresh Raina of Gujarat Lions. The performance will be a key highlight for today’s match. He has been brought in to replace the injured Lendl Simmons. Let’s see if he can provide a good start or not. Parthiv Patel’s inclusion is still not clear. If he didn’t include in the playing xi, then Jos Buttler will get the gloves. “Jos is an important player and a key factor for us in the tournament. He has done for England by performing extraordinarly many times earlier,” Rohit said. The Gujarat side will miss Ravindra Jadeja as he is going to tie knot with Riva Solanki. Yep, guys he is going to marry. It’s his wedding time on Sunday. “According to me, Raina’s captaincy has been the reason for the two wins.. In both the game, our start was rough with the ball, but he remained calm, composed under pressure, and made sound decisions,” said the experienced McCullum. One of the key highlights of today’s match will be the battle of MI spinner Harbhajan Singha nd GL skipper Raina. Harbhajan has taken his wicket four times in the IPL so far. Let’s see if he will be able to get his wicket for the tifth time or not. 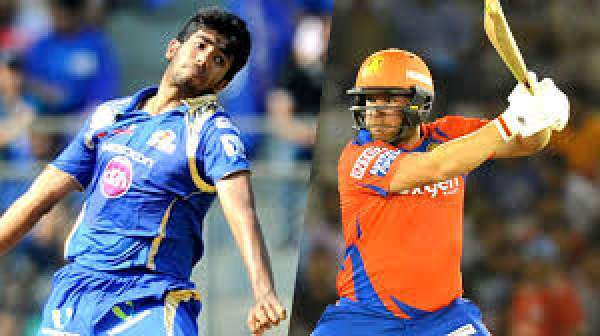 GL vs MI IPL T20 starts at 8 pm IST (2:30 pm GMT) today. Indian audience can catch it on TV channels like Sony Max, Sony Six, Sony Six HD, Sony ESPON, and Sony ESPN HD. While, the option to stream it live online on starsports.com and Hotstar. The UK viewers can catch the live updates on Sky Sports, and can live stream the same on Watch Sky Sports and Sky Go. The US people can watch it on ESPN and stream on Watch ESPN. The rest of the world can watch it on Cricketgateway. Stay tuned for the match result, highlights, full scorecard and much more.